The basic strategy of blackjack is all based on the games calculation. There have been many computer simulations that have tested the strategy and refined it as much as possible. When the strategy is followed as planned, the house's edge is reduced as low as it can be. This is generally about .50%. There are certain variations of the rules from different casinos. Therefore, some small adjustments have to be made to the basic strategy plan. Such as, a casino might allow for you to double down after you split and then the next casino might not. The strategy is also changed when it comes to playing with multiple and single deck games. In order to play blackjack successfully, you must learn to use the basic strategy plan and know useful blackjack tips. Most players begin to learn by using a chart of basic strategy. This chart will show the player how they should play the original cards dealt depending on what the dealer's face up card shows. 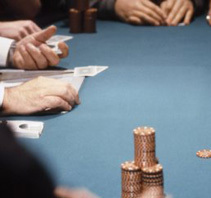 The house gains a higher edge because of the fact that each player has to act on their hand first. Since the basic chart for strategy only handles your initial cards dealt, then you also need to understand what decisions you should make after you have taken a hit. A hard hand is when you receive your two initial cards and neither of those cards are an ace. A few strategies for these hard hands are listed below by action. 9 and the dealer doesn't have three through six. 10 and the dealer doesn't have two through nine. 11 and the dealer has an ace. 12 and the dealer has two or three. 13 and the dealer doesn't have two through six. 9 and the dealer has three through six. 10 and the dealer has two through nine. 11 and the dealer has two through ten. 12 and the dealer has four through six. 13 through 16 and the dealer has two through six. A soft hand is when your initial two cards is an ace. A few strategies for these soft hands are listed below by action. 2/Ace or 3/Ace and the dealer doesn't have a five or six. 4/Ace or 5/Ace and the dealer doesn't have four through six. 6/Ace and the dealer doesn't have three through six. 7/Ace and the dealer doesn't have a two through six. 2/Ace or 3/Ace and the dealer has five through six. 4/Ace or 5/Ace and the dealer has four through six. 6/Ace and the dealer has three through six. 7/Ace and the dealer has three through six. 7/Ace and the dealer has a two, seven or an eight. Pairs is when both of your initial cards are the same. A few strategies for these pairs are listed below by action. 2s or 3s and the dealer doesn't have two through seven. 4s and the dealer doesn't have a five or six. 5s and the dealer doesn't have two through nine. 6s and the dealer doesn't have two through six. 7s and the dealer doesn't have two through seven. 4s and the dealer has two through nine. 2s or 3s and the dealer has two through seven. 4s and the dealer has five through six. 6s and the dealer has two through six. 9s and the dealer has two through six or an eight or nine. 9s and the dealer as a seven, ten or an Ace.